I finally won a Cat 4/5 criterium – in a race I’ve been doing off and on since the mid-1990’s. It’s 4 days later as I write this, and I’m still reveling in it. As I wrote in my 4 hour bike racer post, I set this goal because I previously upgraded my cycling license without ever winning. There’s a million reasons why winning this particular race was no big deal, but I made it the cornerstone of my mid-life crisis. I didn’t want to go to my grave without ever having won. It feels a little boastful to write this, but it’s my blog dammit. I write it for me, and I’m pretty satisfied with myself. 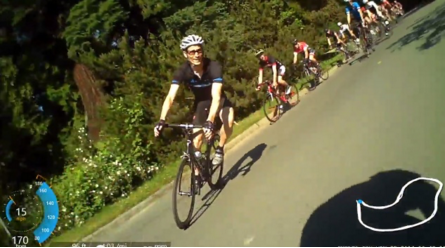 This was the actual race, Seattle’s weekly Seward Park Criterium. It’s open to young and old, male and female racers. Locking down the inside lane. I learned this from another guy in the race. If you keep near the curb, there’s only one direction people can attack you from. You have to come-around sometime in order to win. If the lead-out is not there, just go. Carry momentum. If you’ve got it, just go. Attack when it hurts. Don’t take your foot off the gas when others are hurting also. Another thing that helped was analyzing the lap times and taking a few timed practice loops around the course. In practice, I could get around in maybe 1:50, but in the race our lap times are between 1:30-1:45, so I knew there was no chance of a solo breakaway. Of course, acquiring the best bike money can buy was a big part of my success. But more importantly, I think there was a philosophical reason for winning. In the past 4 years, I’ve changed the way I think about fitness. I’m no longer a weekend warrior like I was in my 30s. I can’t coast on decent DNA any longer – I have to workout to survive. The best I can hope for is to cause my own pain (or “steady discomfort” as they say). The thing is, when you do 30 minutes of exercise per day (OK, some days it’s 5 minutes) – you can do a half marathon without training for it. I workout less now. I don’t ride massive miles, but do try to make my short workouts intense. Turns out, if you want to win a bike race, you make yourself into a bike racer then ride naturally. But I digress. Here are some hacks that worked for me. They’re important too. Caffeine: correlates with better performance, what can I say? A good night’s sleep, or a nap if you can afford it, before the race has helped me too. Soylent: great recovery and every meal drink. Rice protein not whey (though version 1.5 is giving me reflux and gas despite taking stomach enzymes with it). Help support racing however I can – heard a youngster speculating about how he could be win this race – and that’s what it’s all about (motivation and experimentation, not winning). It took 4+ years, not 6 months like I hoped. Interval training (and high intensity intervals) did work, including for training for a marathon with minimal running. I never did the track class, I’d still like to. I acquired an olympic size deadlift bar, and about 2x my weight. I only ever made it to 1x my weight due to my lack of persistence (The 4HR body suggested 3x as the goal). This may be simply because I had it in the wrong room of my house – the garage and basement where it is hard to move around without hitting my head. I never got a power meter, though prices are getting down a lot closer to $500. I traded my rollers for a Wahoo Kickr trainer (with power meter) and took a CycleU class – both helped me establish my Functional Threshold Power which was critical to doing effective computer-guided workouts during the winter. For some reason, sprint workouts on the road require a lot of discipline. you have to head to a patch of road without too many cars, and you have to have the discipline to go back and forth putting yourself in a world of hurt. Doing this with others would definitely help. My 2006 Dogma was stolen from my garage, but luckily my insurance covered the replacement cost of the 2015 version (pictured above) – a freakin superbike. I drank so much whey protein I became lactose intolerant. Now I drink rice protein (primarily in Soylent). I save Magnesium for the evening after a workout – helps relax the legs. During a hard workout or race, I put creatine in my water – a recommendation from the 4HB. Of course, to be an old-guy bike racer like me, you need full body fitness. Just 2 months prior I was not riding outside due to neck and back pain. I’d fallen off my mountain bike (at 0 miles per hour) knocking a rib was out of place. It was made worse by years of computer work. It took several weeks of chiropractic care and acupuncture to get everything loosened up so the ribs would stay in place. I immediately started strengthening. I used the exercises in my 4 Hour Body Cheat Sheet, and an old (fairly basic) Carmichael core training for triathletes video.